Visiting museums is probably the most interesting way to learn the soul of a city. In fact, Hue has grown as a living space of history, art, and architecture. For those of you keen visitors who love learning the history of Hue via their aged collections, here is a short list of Best 5 Hue History Museums. They highly are praised by both their uniqueness and the collection they carry. Price: free of charge or included in the Hue Imperial City entrance fee. Not only the most valuable history museum in Hue, Hue Royal Museum of Antiquities is also the oldest museum in Vietnam. With outstanding values, visitors will enjoy walking to see the vintage collection of Nguyen heritages. Furthermore, you will gain great understanding about its suffering during the two wars in Hue. Originated as Long An palace built by Thieu Tri Emperor, Hue Antique Museum officially housed first Nguyen era artifacts in 1913 under the reign of Emperor Duy Tan. Under Khai Dinh era, the museum was addressed as Musee Khai Dinh. By 1945, it incredibly had a fine collection of around 10,000 artifacts. Sadly, this Hue oldest museum suffered severe looting in two wars: during the Siege of Hue and The Tet Offensive. However, nowadays it’s finally a proud place of more than 8,000 precious objects as seen as one of the most noteworthy in Asia. 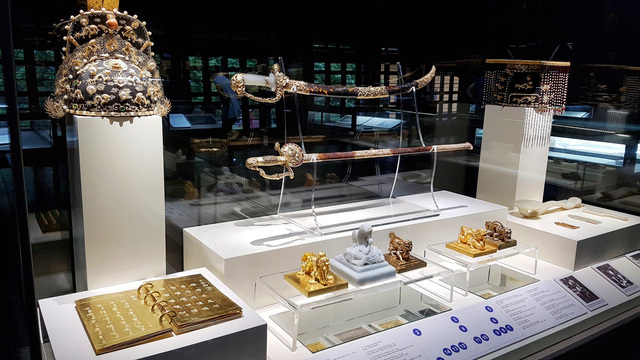 It takes around an hour to walk around the entire of museum seeing priceless royal antiques made from gold, silver, jade and other fragile materials. Apart from the valuable blue and white porcelain collection, visitors can admire the artwork on Minh Mang’s ceremonial costume and Bao Dai’s crown prince robe. The image of many royal antiques. The large collection of royal furniture, including thrones, beds and palanquins will bring you great understanding on how this feudal family lived. In case you want to read more of their gold asset, visit 10 Nguyen Gold Treasures You Only See in Hue, Vietnam. You can also book a tour to do a combined visit of Hue Citadel and Hue Antiquities Museum to make it a fruitful walk of yours in the most-visited attraction in Hue. Most visitors skip this even ticket is included when you buy Hue Imperial City daily pass. Huge collection of Hue land from 2000 years ago till Vietnam War history. The most profound Hue History Museum. Situated in the former Quoc Tu Giam royal college, Thua Thien Hue history Museum is a fantastic attraction to learn the origin of Hue. You will notice of this museum right at the entrance of Hue Citadel with many tanks and helicopters displayed in the open space. Step inside the compound, the main palace Di Luan Duong houses wonderful Champa collection ranges from architectural vestiges, coins, ceramics, wood blocks prints. Besides, you will also find Dong Son bronze drums (represent for early Dai Viet civilization) and various Sa Huynh artefacts (Early Champa Civilization). On a side note, the two concrete buildings on the sides house contemporary war exhibition of the two Indochina Wars. There are main progressed year of war and map of strategic battles that happened in Hue. Specially, the map of Tet Offensive will help you understand what happened and why the Hue Citadel is in such bad condition nowadays. You guarantee to open your eyes and knowledge when visiting this museum! Join Hué Walk of Revolution Tour and learn more about two Indochina Wars in Hue. Private Nguyen dynasty ceramics in 16th till 19th century collection. Opening hours : 09:00-17:00 on Tue to Sun, Mon close. Surprisingly, the Museum of Nguyen Traded Ceramics is the first private museum to be opened in Hue. Situated in a private mansion of an honored Nguyen Dynasty Mandarin, Tran Dinh Ba, this museum has a large collection of ceramic artifacts and other antiques. They include tea and betel sets, cooking and food storage utensils and wine jars. This collection is indeed valuable assets for those who love learning about the most flourishing period of Nguyen Dynasty history and Vietnam ceramic trading history. Displayed exhibition of Ho Chi Minh life and contribution to Vietnam history. Housed in a modern building in the heart of Hue city, Ho Chi Minh Museum in Hue displays photographs and artifacts relating to his youth and family life during the years he spent in this ancient city. In this unique Hue museum about Ho Chi Minh, you will quickly learn how the revolution of Vietnam started in early century and role of Ho Chi Minh in founding Vietnam Communist Party and leading the country to success in 1975 against America. Display exhibits of old RVN Prison. Chin Ham prison is a historical relic in Hue. Another great address for visitors who love learning of Vietnam history is the Chin Ham Prison. Built originally by the French as an old weapons store, Ngo Dinh Can rebuilt this abandoned facility into a prison in 1955 . He was the younger brother of RVN President Ngo Dinh Diem with a well-known ruling style called “Iron fist”. Subsequently, this prison kept many anti-government activists till 1963 when Ngo Dinh Diem was assassinated. Chin Ham Bunker was destroyed later in the same years. This is one of the bunker which captured many anti-government activist. At the moment, there are 8 bunkers rebuilt and decorated with mannequins to show the harsh conditions and treatment once experienced by prisoners. All now opens to public! With theses 5 fantastic Hue History Museums, your walk through Vietnam history can’t be more lively and interesting than ever. You will surely leave Hue with huge appreciate its profound and multi-layer history. Feeling curious about these places to visit in Hue, contact us to have a private guide or joining a Hue Walking Tour with Bee Bee Travel to take you for a wonderful trip around Hue.